The Haryana Government has attracted investments of Rs 22,000 crore during the past two years and investment proposals of Rs 55,000 crore are in the pipeline. However, investment of only Rs 40,000 crore had been made in the state from the its inception till March, 2005. Power consumers in Haryana have a reason to cheer. The government has announced that it will procure additional power over the next five months to cater to the increased need of electricity during summer months. Banking arrangements have been made with different state corporations to deliver at least 10 per cent extra power to the state. A rally aimed at "protecting" the state roadways was held under the aegis of the Haryana Roadways Employees Joint Struggle Committee here today. The district administration thwarted a child marriage with the arrest of 20-year-old groom and his kin at Hali Colony here yesterday. Panic gripped farmers as the duststorm accompanied by a light shower lashed the town and its surrounding areas last evening. Though the sudden change in weather did not cause any damage to the huge quantity of wheat lying at the grain market, it certainly jolted the farmers who were awaiting its procurement. Government agencies in Haryana have so far procured 17.60 lakh metric tonnes (MTs) of the total 19.36 lakh MTs of wheat from 360 wholesale markets of the state. An official spokesperson said while 17.60 lakh MTs had been procured by the six government agencies. Eminent vocalist Pandit Jasraj has urged the Haryana government to take appropriate steps to encourage the artistes. He regretted that despite being a culturally rich state, no step had been taken to boost the morale of the artistes. Pandit Jasraj was among 13 artistes who were honoured at the second state award giving ceremony. A few women and children today staged a dharna in protest against the opening of a liquor vend at Ramnagar colony of Jagadhri and later locked it. Haryana Chief Minister Bhupinder Singh Hooda has announced that a jem and jewellery park would soon be set up at the proposed Industrial Model Town in Rohtak. It would be established on the pattern of Gurgaon, where such a park was being developed at a cost of Rs 90 crore. The Haryana Directorate of Small Savings will give more than Rs 25,000 as cash awards to those who invest in the Haryana Small Savings Puruskar Yojna in the current fiscal year. Brahm Dutt Yadav, a resident of Saharanwas village, was crushed to death by a vehicle while he was crossing the Rewari-Mahendergarh road near the village on Saturday. The Rampura police on a complaint lodged by Sant Lal Yadav, son of the deceased, has registered a case. Two persons were killed and around 10 seriously injured when a mini tourist bus overturned after it collided with a truck near Saha village, on the Ambala-Jagadhri road, this afternoon. The deceased comprised a woman and a girl. They have been identified as Sunita (40) and Suhani (10). According to information, the bus, in which members of three families were travelling, was going from Manali to Delhi. Ambala City MLA Venod Sharma went on a foundation stone laying spree of various development projects here today. Speaking at a function at Prem Nagar, after the statue of Lord Hanuman was installed in a newly constructed temple, he said development works were being carried out all over the city. To ensure adequate power supply to consumers with minimum interruption during the ongoing summer and ensuing paddy season, the Haryana government has directed the Haryana power utilities to speed up various consumer-friendly measures and arrange material required for timely maintenance of power transmission and distribution network. This was disclosed by Haryana Chief Minister Bhupinder Singh Hooda while addressing a state-level Aggarwal Sammelan organised on the premises of Vaish College here today. "Investment of Rs 2 lakh crore will be ensured in the state in the coming years to provide ample employment opportunities to our youth," Hooda asserted. The Chief Minister announced that a chapter on Maharaja Aggarsen would be included in the curriculum of schools of Haryana so that the students could derive inspiration from his life. He said former Chief Minister Banarasi Das Gupta's village, Mahnehru, would be made a model village having all modern facilities. Lauding the role of Maharaja Aggarsen in motivating the society, Hooda described him as a great socialist and embodiment of non-violence who set up a unique example of equality by motivating the people to donate Re 1 and one brick for the help of those who were interested in settling down at Agroha. Hooda reminded the people that Mahatma Gandhi had laid the foundation stones of only two educational institutions in the country, which included Vaish High School at Rohtak and the other at Vardha. The Chief Minister exhorted the Aggarwal community members, especially the youth, to take a solemn pledge to spend minimum money on their marriage ceremonies. He sought the cooperation of the community in making Haryana No. 1 state in the country in the years to come. Haryana Minister of State for Urban Development Savitri Jindal said the history of the Aggarwal Samaj was 5,200 years’ old. She urged the community members to eradicate social evils and contribute their mite in the progress and prosperity of the country. Member of Parliament Santosh Bhagdodiya, MLAs Devender Bansal and Ramesh Gupta, former ministers Ganeshi Lal and Subhash Goel, general secretary of All-India Aggarwal Sammelan Bal Kishan, president of the Haryana Aggarwal Sammelan Gopal Sharan Garg and Rajiv Jain also addressed the gathering. Among others present on the occasion were Haryana Agriculture Marketing Board chairman Shadi Lal Batra, commissioner, Rohtak Division, N.C. Wadhwa, deputy commissioner R.S. Doon, SP Dr C.S. Rao, District Congress President (Urban) Ashok Kaka, and Municipal Council president Ajit Jain. Finanacial Commissioner and Principal Secretary, Power, Ashok Lawasa revealed that the Himachal Pradesh State Electricity Board would return 40-100 MW power from June, between 1900 hours to 0600 hours. Similarly, Uttranchal Power Corporation Limited and corporations of Tamil Nadu and Maharashtra and Tata Power Company Limited would also return the banked power ranging from 40 to 200 MW during the coming peak demand season in different time slots. The state government had also made arrangements to procure 100-125 MW power from Jammu and Kashmir from next month till September and would return the same from November to March next year. As much as 200 MW power would be procured from Gujarat and 50-75 MW from Uttaranchal Power Corporation Limited under the banking arrangements, he added. At the same time the Haryana government has directed the power utilities to ensure that material required for carrying out maintenance of transmission and distribution networks is arranged in advance so that there is minimum inconvenience to consumers during the summer and paddy season. The Uttar Haryana Bijli Vitran Nigam (UHBVN) and Dakshin Haryana Bijli Vitran Nigam (DHBVN) had been directed to ensure that the damaged transformers were replaced within 48 hours in rural areas. They had also been directed to ensure that the report of the damaged distribution transformers was sent timely by the field staff to the quarter concerned. Lawasa said the utilities had also initiated the process of procuring 33157 new distribution transformers of various capacities. He said the Haryana Vidyut Prasaran Nigam had already completed the special maintenance of all the grid substations and major transmission lines to avoid outage. Addressing rallyists, employee leaders Baldev Singh Ghanghas and Harinarayan Sharma affirmed their pledge to launch a lasting battle and finally take the matter to the people's court. Their main demands include the inclusion of 8,000 new buses in the roadways fleet, filling of vacant posts, stopping the contract system and privatisation, withdrawal of suspension and transfer orders of employee leaders and framing a regular bonus policy for roadways employees. The protesters resolved to hold meetings at all roadways depots in the state from May 24 to 31, if their demands were not met by then. This would be followed by relay fasts by depot employees at the transport commissioner's office in Chandigarh from June 4 to 15. Panchayats will also be involved in the struggle and the employees will resort to "chakka jam" if nothing else works. Employee leaders Sarbat Singh Poonia and Ram Kumar Verma alleged that the state government was planning to hand over the roadways department to the private sector. They pointed out that instead of strengthening the Haryana Roadways' fleet of buses, the Transport Minister was more keen on running Volvo buses, giving permits to near and dear ones and allowing illegal private vehicles for vested interests. The protesters handed over a charter of demands to Chief Minister Bhupinder Singh Hooda, who was in the town today. According to sources, the groom, Sanjay,alias Bablu,was getting married to 11-year-old Varsha, a resident of Baghpat district in Uttar Pradesh. However, the administration swung into action after receiving a tip-off in this regard. The police arrested the groom and his father and produced them in a local court.The Chief Judicial Magistrate has also summoned the bride's family to the court on May 5. Deputy director,Agriculture, Manjeet Singh Nain said the light shower would certainly damage the wheat fodder. Head of arhtiyas Jaibhagwan Goyal fired a fresh salvo at the administration over the delay in lifting of wheat. He alleged that a huge quantity of wheat was rotting in the market and all claims of the administration of speeding it up was turning out to be hollow. "Who'll be responsible for the damage to wheat if a heavy shower lashes the area in the coming days? " he asked. Government agencies in Haryana have so far procured 17.60 lakh metric tonnes (MTs) of the total 19.36 lakh MTs of wheat from 360 wholesale markets of the state. An official spokesperson said while 17.60 lakh MTs had been procured by the six government agencies, traders had purchased 1.76 lakh MTs of wheat at the minimum support price of Rs 850 per quintal, including a bonus of Rs 100 per quintal. Kaithal district was leading in procurement with a total of 3.40 lakh MTs, followed by Karnal 3.37 lakh MTs, Fatehabad 2.66 lakh MTs, Jind 2.52 lakh MTs, Sirsa 2.10 lakh MTs, Kurukshetra 1.95 lakh MTs and Panipat 1.08 lakh MTs. A sum of Rs 2195 crore had been sanctioned for the procurement of wheat and the farmers are being paid between 48 to72 hours. Eminent vocalist Pandit Jasraj has urged the Haryana government to take appropriate steps to encourage the artistes. He regretted that despite being a culturally rich state, no step had been taken to boost the morale of the artistes. Pandit Jasraj was among 13 artistes who were honoured at the second state award giving ceremony organised by the Haryana Institute of Fine Arts at NDRI auditorium here today. Governor A.R. Kidwai honoured the awardees, while local MP Arvind Sharma was the guest of honour. Talking to reporters, Pandit Jasraj said he had met tourism minister Kiran Chaudhary and stressed upon the need to take steps to honour the artists. 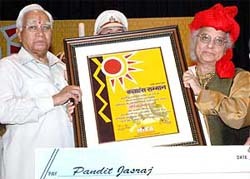 Pandit Jasraj was given Kalahans Samman; theatre personality Rajinder Gupta (Panipat) Kalamihir Samman; Ganesh Prasad Sharma (Ambala) Kalanidhi award for Indian classical music and dance; Viren Tanwar (Hisar) Kalabhoomi Samman; senior journalist Nirupma Dutt Kalabhaskar Samman; Manphool Singh Dangi (Sonepat) Kalasamrat Samman; Budhi Ram Prajapati Kalachandrika Samman; Baldev Singh (Shahbad Markanda) Karn Bhoomi Samman; and Hriday Prakash Kaushal (Charkhi Dadri) Kaladeep Samman. Prem Lata (Karnal), Madhuresh Bhatt (Kurukshetra), Krishna Chahal (Indri) and Rajesh Kumar (Hisar) were also honoured. On the other hand a contractor of the vend, Mukesh Kumar, claimed that he had got permission to open it. As per sources, the contractor brought a few cartons of country liquor and this led to resentment among the women. The women said since Ramnagar was a residential area and there were three schools nearby so they would not allow the vend to function. Hooda said this while addressing the annual function of the goldsmiths and jewellers association here today. He assured the office-bearers of the association that their demand for land for opening a community centre would be considered after they submit a formal request in this regard. Disclosing this here today, a spokesman of the department said a free coupon each would be given on an investment of Rs 5,000 whereas in case of women investors, a free coupon each would be given on an investment of Rs 2,500 as a special incentive. Two persons were killed and around 10 seriously injured when a mini tourist bus overturned after it collided with a truck near Saha village, on the Ambala-Jagadhri road, this afternoon. The deceased comprised a woman and a girl. They have been identified as Sunita (40) and Suhani (10). According to information, the bus, in which members of three families were travelling, was going from Manali to Delhi. As it crossed Saha village, it collided with a truck and overturned. Villagers and shopkeepers rescued injured passengers from the bus. 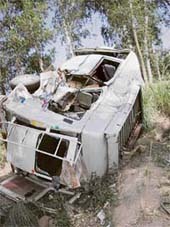 The bus was badly damaged in the accident. Three of the injured - Anita, Hemant and Sanjay Jain - who were admitted to the Mulana Medical College were later referred to the PGI, Chandigarh. Two of the injured children - Saloni and Rashita - were also sent to the PGI. Other six, including Salinder, Divya, Vachita and Rani, have been admitted to the Civil Hospital, Ambala Cantonment. Senior police officers reached the scene of the accident to monitor the rescue operation. The police has registered a case and investigating the matter. Ambala City MLA Venod Sharma went on a foundation stone laying spree of various development projects here today. Speaking at a function at Prem Nagar, after the statue of Lord Hanuman was installed in a newly constructed temple, he said development works were being carried out all over the city. He said Chief Minister Bhupinder Singh Hooda had granted a sum of Rs 185 crore for laying of sewerage system in Ambala City, the highest grant in the history of the state. He donated a sum of Rs 51,000 for the completion of the remaining work at the temple. Earlier, he administered polio drops to children below five years of age at the General Hospital. He said every child should be given polio drops to save them from the dreaded disease. Inaugurating a tube-well drilling work at Mathura Nagri in ward No. 6, he said a sum of Rs 16 lakh would be incurred on the work. Similarly, he inaugurated work on a tube-well, to be drilled at the depth of 1,100 feet, in ward No. 18 in the city. Mr Sharma also inaugurated the work on the widening of road from Government Polytechnic College to Jandli at the cost of Rs 60 lakh. The four-laning of the road will be completed within four months. He later inaugurated the widening and strengthening of Jalbera road from Manav Chowk to municipal limits of the city, which will cost Rs 85 lakh. Ashok Lavasa, financial commissioner and principal secretary (power), during a meeting with senior officers of the utilities discussed the expected power availability and supply position up to September. He said around 10 per cent extra power would be supplied to consumers during the next five months as compared to the corresponding period of the last year for which the utilities were required to streamline the system. Managing directors of various Haryana power distribution corporations were directed to assign duties to nodal officers of the rank of sub-divisional officers in each of the operation circle to monitor the power availability and regulate power supply position daily. These officers would ensure proper implementation of power regulatory measures and give a regular feedback to the higher authorities.